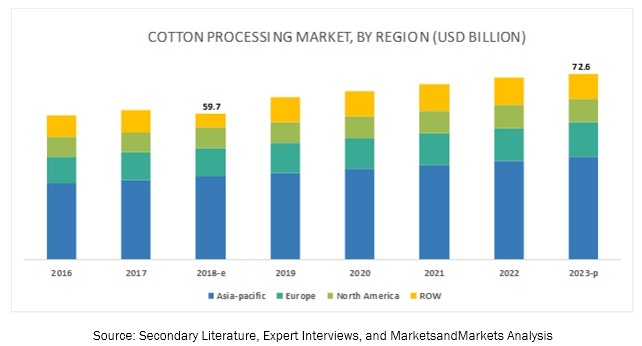 [134 Pages Report] The cotton processing market is estimated to grow at USD 59.7 billion in 2018 and is projected to grow at a CAGR of 4.0% from 2018, to reach a value of USD 72.6 billion by 2023. The growth of the cotton processing market is driven by the increasing demand for cotton processing in the textile industry and the rising adoption of cottonseed meal as feed for animals. The lint segment is projected to account for the largest share in the cotton processing market during the forecast period. The lint segment is estimated to account for the largest share of the cotton processing market in 2018. Lint is the fiber separated from cotton seeds through the ginning process. The rise in urbanization and change in the lifestyle of consumers have led to an increase in the demand for textiles, which, in turn, is projected to drive the growth of the lint segment further. In addition to this, the growing awareness about product quality among consumers is projected to reflect positively on the growth of the cotton processing market in the coming years. The textiles segment is projected to account for the fastest-growing market during the forecast period. On the basis of application, the cotton processing market is segmented into textiles, medical & surgical, feed, consumer goods, and others. The textiles segment is projected to be the fastest-growing segment in the cotton processing market from 2018 to 2023. This is due to the rising per capita income and changing preferences of consumers, which is driving the market growth. Moreover, increasing investments and policy support by the governments have also fueled the growth of the textile industry in countries such as India and China. On the basis of type, the cotton processing equipment market is segmented into spinning and ginning. The spinning segment is projected to be the dominant market in the cotton equipment processing market from 2018 to 2023. This is due to the increasing yarn consumption in the textile, medical & surgical, and consumer goods sectors. Rising expectations of the consumers are also encouraging innovations, in terms of technology, for producing better quality products. The changing preferences of consumers, blended with technological advancements, is driving the market growth. The automatic segment is projected to account for the largest market during the forecast period. On the basis of operation, the cotton processing ginning equipment market is segmented into automatic and semi-automatic. The automatic segment is projected to be the fastest-growing segment in the cotton processing ginning equipment market from 2018 to 2023. This is due to the introduction of advanced technologies by machine manufacturers for increasing the productivity of mills. Automatic machines have reduced the labor cost and increased the profit margin of ginning mills. As a result of this, the automatic segment is projected to grow further in the forecast period. Asia Pacific is projected to account for the largest market size during the forecast period. The market is also segmented, on the basis of region, into North America, Europe, Asia Pacific, and RoW. Asia Pacific is projected to dominate the cotton processing market throughout the forecast period. Some factors influencing this dominance in the market include the rising textile industry, consumer goods, and animal feed. Rising chronic diseases and accidents along with increasing hygiene concerns among consumers have given rise to the consumption of processed cotton. Moreover, the technological advancements to increase the productivity is also propelling the market further. Key players identified in cotton processing market include Lummus Corp (US), Bajaj Steel Industries Limited (India), Nipha Exports Private Limited (India), Shandong Swan Cotton Industrial Machinery Stock Co., Ltd. (China), Cherokee Fabrication (US), Reiter (Switzerland), and Toyota Industries (Japan). 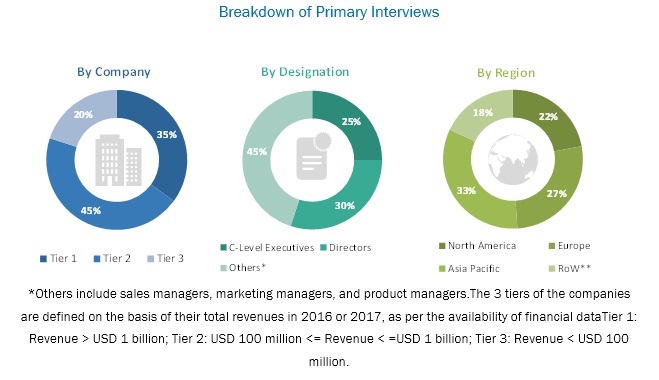 Key players are focusing on increasing their presence through undertaking investments and expansions and developing products specific to consumer preferences in these regions. These companies have a strong presence in Asia Pacific and North America. In November 2018, Rieter (Switzerland) upgraded its end spinning product portfolio by introducing spinning machines, G 37 and G 38. The company also introduced two new compact-spinning machines, K 47 and K 48. This would strengthen the company’s product portfolio. In May 2018, Swiss Rieter AG company, a subsidiary of Rieter, collaborated with Uzbek Textile Industry Association (Uzbekistan) and launched a textile engineering project. With this collaboration, Rieter AG would supply Uzbekistan with the latest model of the Airjet spinning equipment. In April 2017, Rieter (Switzerland) opened a service branch in Kahramanmaraº, Turkey, to provide a better service to its customers in Southeast Turkey. In November 2017, Bajaj Steel Industries Limited (India) received a contract of opening three cotton ginning factories from Cotton, Spinning, Weaving and Garments Holding Company (Egypt). This factory would be based on rotobar ginning technology and would help Bajaj steel to expand its business in Egypt. In April 2015, Rieter (Switzerland) launched an Application and Research Centre for Spinning Technology in China. This expansion would strengthen its position in the Chinese textile industry. In 2013, Shandong Swan Cotton Industrial Machinery Stock Co., Ltd. (China) shifted its headquarters to Jinan Yaoshan Industrial Park for better operation administration of the company, as this would increase its efficiency to connect with its other subsidiaries. 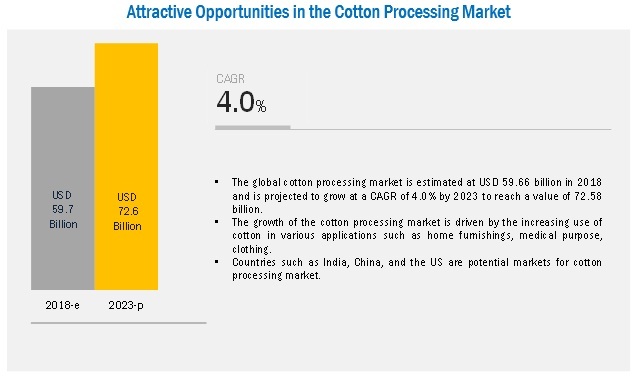 What are new application areas that the cotton processing companies are exploring? Which are the key players in the cotton processing market and how intense is the competition? What kind of competitors and stakeholders would be interested in cotton processing market? What will be their go-to-market strategy for this market, and which emerging market will be of significant interest? How are the current R&D activities and M&As in the cotton processing industry projected to create a disrupting environment for the agricultural sector in the coming years? The study involves four major activities to estimate the current market size for cotton processing. Exhaustive secondary research was done to collect information on the cotton processing market as well as the peer and parent markets. These findings, assumptions, and market size was validated with industry experts across the value chain through primary research. Both the top-down and bottom-up approaches were employed to estimate the complete market size. Thereafter, the market breakdown and data triangulation were used to estimate the market size of segments and subsegments. In the secondary research process, various secondary sources such as Hoovers, Bloomberg BusinessWeek, and Dun & Bradstreet were referred to, to identify and collect information for this study. These secondary sources included annual reports, press releases & investor presentations of companies, white papers, certified publications, articles by recognized authors, gold standard & silver standard websites, food safety organizations, regulatory bodies, trade directories, and databases. The cotton processing market comprises several stakeholders such as cotton processing equipment manufacturers and suppliers, cotton ginning companies, cotton spinning companies, textile manufacturing companies, medical & surgical companies, feed manufacturers, raw material suppliers, cotton processing equipment packaging companies, feed safety agencies, government and research organizations, and state farming organizations. The demand-side of this market is characterized by the rising demand for high cotton consumption. The supply-side is characterized by advancements in technology and diverse application industries. Various primary sources from both the supply and demand sides of the cotton processing market were interviewed to obtain qualitative and quantitative information. The key players in the industry and markets were identified through extensive secondary research. The value chain and market size of the cotton processing market, in terms of value, were determined through primary and secondary research. All percentage shares, splits, and breakdowns were determined using secondary sources and verified through primary sources. All possible parameters that affect the cotton processing market covered in this research study were accounted for, viewed in extensive detail, verified through primary research, and analyzed to obtain the final quantitative and qualitative data. The research included the study of reports, reviews, and newsletters of top market players, along with extensive interviews of key opinion leaders such as CEOs, directors, and marketing executives. After arriving at the overall market size from the estimation process described above, the total market was split into several segments. To complete the overall market engineering process and arrive at the exact statistics for all segments, the data triangulation and market breakdown procedures were employed, wherever applicable. The data was triangulated by studying various factors and trends from both the demand and supply sides. In addition to this, the cotton processing market size was validated using both the top-down and bottom-up approaches. It was then verified through primary interviews. Hence, three approaches were adopted-the top-down approach, the bottom-up approach, and the one involving expert interviews. Only when the values arrived at from the three points match, the data is assumed to be correct. Lummus Corp (US), Shandong Swan Cotton Industrial Machinery Stock (China), Bajaj Steel Industries Limited (India), Rieter (Switzerland), and Cherokee Fabrication (US). This research report categorizes the cotton processing market based on product type, application, equipment type, operation, and region.